S.D. Nelson, Standing Rock Sioux, author, artist, and educator, taught middle-grade students in Flagstaff for 25 years. I’ve taught at Diné College (Navajo) during my 20 years of working with Navajo teachers. We both have observed again and again that children who have difficulty with reading have difficulty with school. The love of reading—and the skills needed for reading—begins at home when a child snuggles next to Mom, Dad, Grandma or an older sibling with a book or a magazine. Few public libraries and even fewer bookstores exist on many of the tribal nations. S.D. Nelson had an idea. His grandchildren love bringing home magazines from school, especially Highlights, and sharing them with family. Thus the idea behind Read at Home began. In 2017-2018, our first year, Read-at-Home put every donated penny to work to provide subscriptions to Highlight’s High Five to over 350 preschool children at the Chinle/Canyon de Chelley, Many Farms, and Tsaille (Navajo Nation), and to another 150 Head Start children in Idaho at Fort Hall (Shoshone-Bannock). We hope to continue to work with preschool teachers, parents, and children and respond to new requests from other Native American schools. Please help us. Every contribution goes fully to connecting children and their families with reading at home. Want to help? Make a tax free donation. More information is available. Enjoy the delightful photos of children and families enjoying books together. Give a child a year of reading for only $15.00. 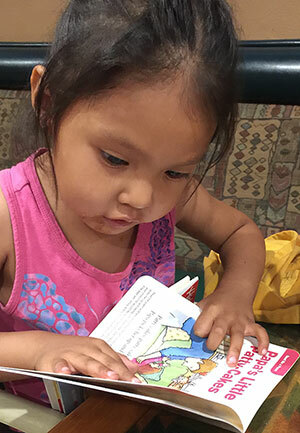 Read at Home promotes reading for Native children, ages 2 – 6, with their families. We strengthen early literacy skills by providing high quality magazines to children at school and also offering parent-teacher information sessions. Magazines are given to the children to keep and take home to encourage literacy activities within families. Read at Home, Inc. is a 501(c)3 nonprofit organization.